Grenada is an island at the southern end of the Grenadines chain in the Caribbean Sea, just northeast of Venezuela. The whole country is only 133 miles² and at the time of the invasion had a total population under 99,000. Long a British colony, Grenada had zero strategic value and WWII passed the island by. The country became independent on 7 February 1974. The first leader was Eric Gairy, an erratic and ineffective premier who was unpopular with Grenadians. At independence, Grenada had no enemies and faced no military threats, so the country’s tiny army was equipped with WWII-era equipment, mainly ex-British Enfield rifles and Bren machine guns, plus some American-made M3 Grease Gun submachine guns. Gairy was overthrown by a coup in March 1979, led by a marxist group called the New Jewel Movement under Maurice Bishop. Bishop established ties with the USSR, North Korea, Vietnam, Cuba, and East Germany; and thus incurred the wrath of the USA. All political parties except New Jewel were abolished, and promised elections were never held. At the same time, Bishop signed military pacts with the USSR, Cuba, and North Korea, bringing in a massive influx of small arms and anti-aircraft guns, plus a gargantuan quantity of ammunition. A contingent of Cuban troops was based in Grenada. 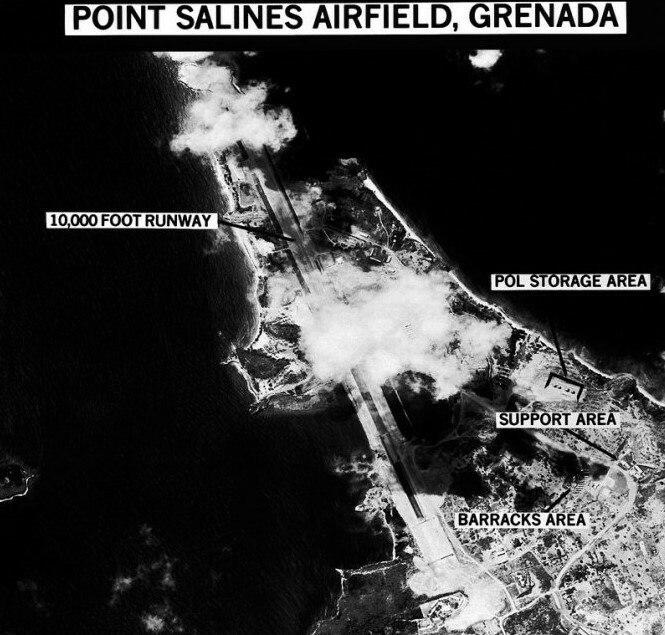 Using Soviet funds, a new “international airport”, Port Salines IAP, was built by British and Canadian companies with Cuban assistance. With a wide, hardened 10,000′ runway; the new airport was claimed by the Grenadians to allow Boeing 747 jumbo airliners to fly tourists direct to the island. The runway was certainly long enough for a 747 but it was also capable of handling Soviet Tu-16 bombers and fully-loaded Il-76 heavy transports, and the incoming administration of Ronald Reagan was concerned that it would be used by the USSR for meddling in Central America. By 1982, Bishop changed his outlook somewhat and sought a course similar to Yugoslavia, a socialist/capitalist hybrid which would be aligned with the Soviets but none the less amicable to the west. Companies from Europe were invited to invest in Grenada. Bishop’s plans did not work out, as the USA was still relatively cold towards him and meanwhile, other leaders in the New Jewel party wanted to make Grenada a full-blown communist nation. On 19 October 1983, a coup by New Jewel hardline communists placed Bishop under house arrest. The country’s small military and police force was of divided loyalty and that afternoon, he was allowed to return to his office. The hardliners simply murdered him later that day, dissolved the government, put the military in charge, and declared martial law. A nationwide curfew was announced and it was warned that anybody, Grenadian or foreigner, would be shot on sight. A number of American medical students were studying in the country and their safety was a concern, moreover Reagan feared development of a hostage situation like the one in Iran three years before. Finally, he wanted to simply end communism in the country before the nearly-complete airfield opened. Six days later, on 25 October 1983, the United States invaded the country, in Operation “Urgent Fury”. All of the machine guns provided by the Soviets were of postwar design, however the Grenadians still had some Brens in service. The Bren light machine gun was the standard British weapon of it’s class during WWII. It weighed 25 lbs with a full magazine, and was full-auto with a 500rpm rate of fire. It used the .303 British cartridge from a 30-round top-mounted box magazine, and had a range of about 1,800 yards maximum. It was normally fired prone from it’s folding bipod. 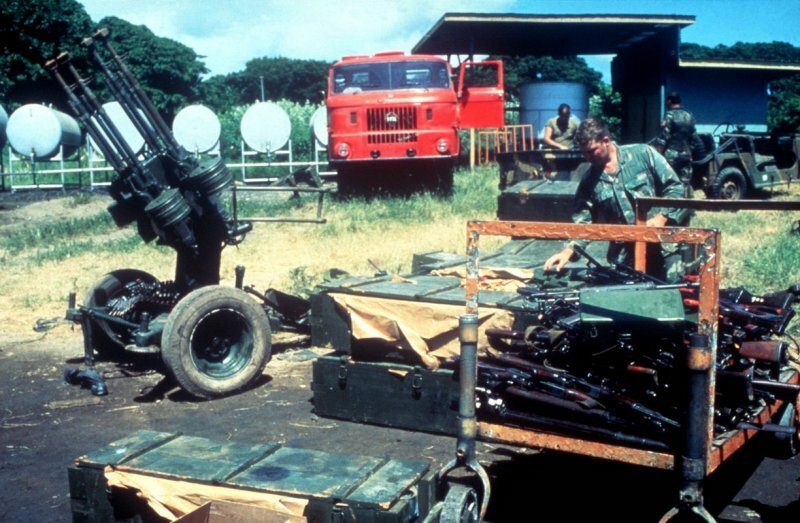 Grenada used both the Bren Mk.I and later-production Bren Mk.III. Neither was in notable use any longer by 1983, but none the less some were encountered in battle, and/or captured intact. 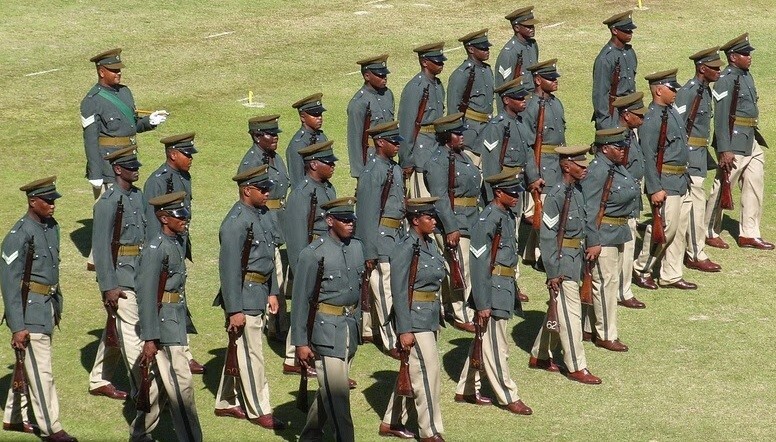 The Enfield family was the main weapon of the small Grenadian army at the time of independence, and Enfields remained in use after the switch to communism. Grenada’s Enfields were a mix of submodels, but the most common was the Enfield No.4 Mk.I and the SMLE Mk.III. All of the Enfields were bolt-action rifles, firing the .303 Mk.VII cartridge with a muzzle velocity of 2,441fps and an accurate range between 505-1,000 yards depending on the model. All had an internal ten-round magazine which was loaded by five-round stripper clips. Like the Bren, the aging Enfields were no longer standard issue to the Grenadians, having been replaced by the AK-47 as the main battle rifle. None the less, they were encountered. The other WWII-era rifle used by the Grenadians was the Mosin-Nagant. Both the Mosin-Nagant 91/30 and Mosin-Nagant M1944 versions were captured by the Americans in 1983, but the M1944 (the short carbine version) was much more common. The Mosin-Nagant 91/30 was the main Soviet rifle throughout WWII, with the M1944 version being introduced later in the war. Both versions of this bolt-action rifle weighed about 9 lbs and fired the 7.62x54mm(R) cartridge from a stripper-loaded five-round magazine. Muzzle velocity was 2,700fps depending on the specific cartridge model and rifle version, and the weapon was accurate out to 550 yards. In other armies, much longer ranges were accurately possible however the time between the first delivery of Mosin-Nagants and the American invasion was only about 2 ½ years so proficiency was poor with the Grenadians. 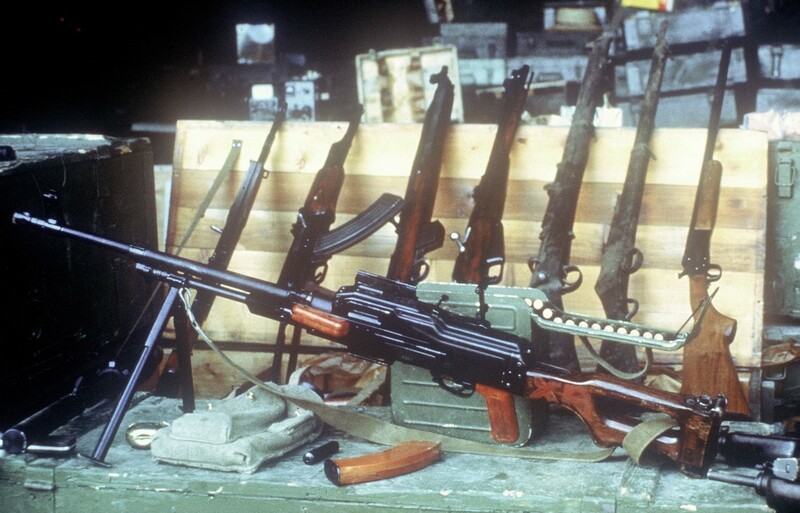 The Cubans did not use these rifles, being fully equipped with either SKSs or AK-47s. Both the Enfields and Mosin-Nagants were hopelessly obsolete by the 1980s and from a different time compared to the more common AK-47s or the M16s which the Americans used. 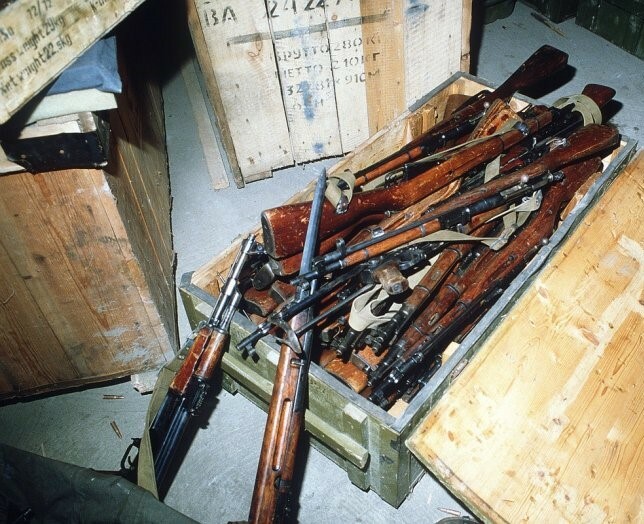 Cuba shipped 180 ex-Soviet WWII-veteran PPS-43 submachine guns to Grenada between 1980-1982. This full-auto submachine gun fired the 7.62mm Tokarev cartridge from a 35-round magazine. 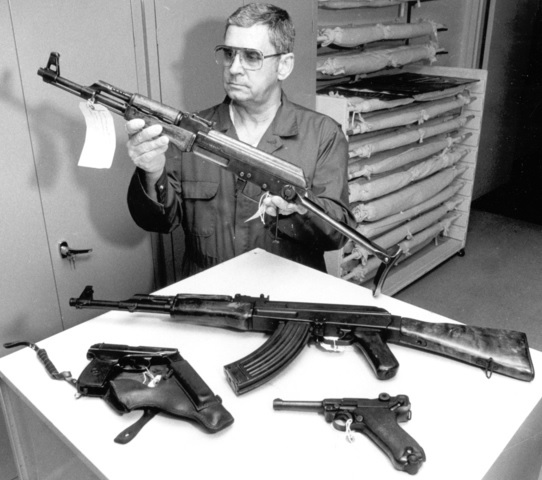 Designed for cheap and fast manufacture during WWII, the PPS-43s which were sent to Grenada in the 1980s were probably well-worn and their role was already filled by more modern AK-47s. They were not frequently encountered during the American invasion. Amazingly, a few of the Sten submachine guns used by the British garrison on the island during WWII, and then inherited by the new Grenadian army at independence, were still in service. The variant found was the Sten Mk.II, which was the most common of all Sten versions. Of WWII manufacture, this basic submachine gun fired the 9mm Parabellum cartridge from a 32-round horizontal magazine. It was accurate only to about 100 yards and definitely was a close-quarters combat weapon. Grenada was in an unusual situation regarding this gun; one of the few times in history that the 9mm Parabellum round was not common; as neither the other WWII British nor WWII Soviet weapons could use it; likewise it was incompatible with the post-WWII communist-bloc firearms and the few old American-made weapons. One of the most surprising captures was a tiny quantity of M3A1 “Grease Gun” submachine guns, of American WWII fame. The Grease Gun was 2’6″ long and weighed 8 lbs without a magazine. It fired the .45 ACP cartridge from a 30-round box magazine (three of which can be seen below the gun in the above photo). The M3A1 was the WWII American contemporary of the Soviet PPS-43 and British Sten (both of which Grenada used), in that they were cheap, easy-to-build, close quarters battle weapons. 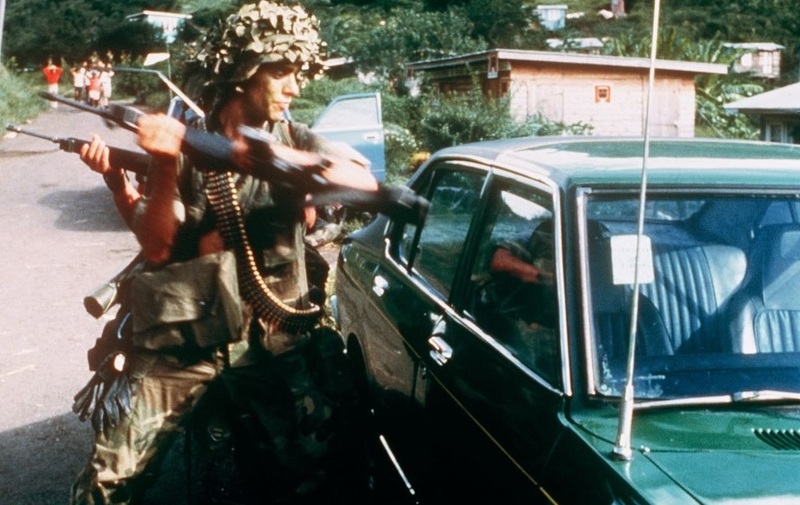 As Grenada became independent long after the M3 was generally gone from American use, the origins of the weapons captured there in 1983 are uncertain. It’s possible they were Lend-Lease leftovers from the British during WWII, or (more likely) that they came from Cuba. Still another possibility is that Grenada itself purchased some on the world arms black market using it’s own tiny military budget. Few WWII-era handguns were encountered or captured, as both the Grenadians and Cubans had standardized on the Makarov. 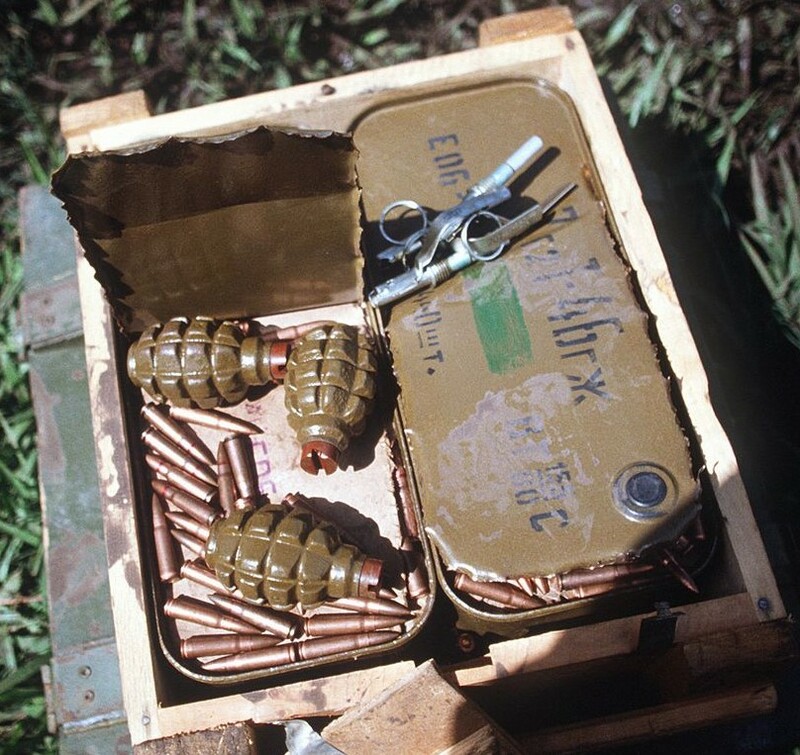 Some WWII-vintage Soviet F1 grenades were captured by American troops. The Soviet F1 hand grenade of WWII weighed 1.3 lbs and had a 3 ½ second delay. A contemporary of the USA’s WWII Mk2 pineapple grenade, the F1 still remained an effective weapon in the 1980s. 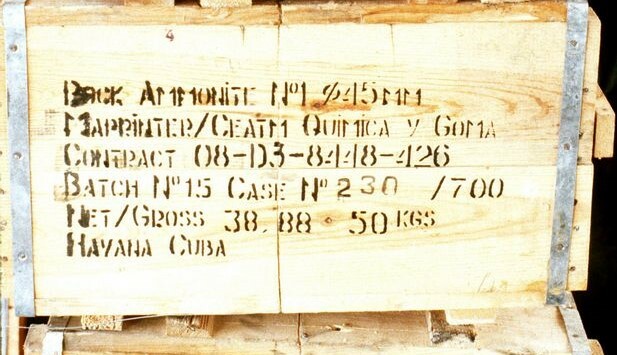 Initially it was thought that Grenada received all of it’s F1 grenades via Cuba, however some may have come from North Korea. Most of the mortars used by the Cubans and Grenadians were of Cold War-vintage, however some 82-PM-41 mortars of WWII vintage were encountered as well. 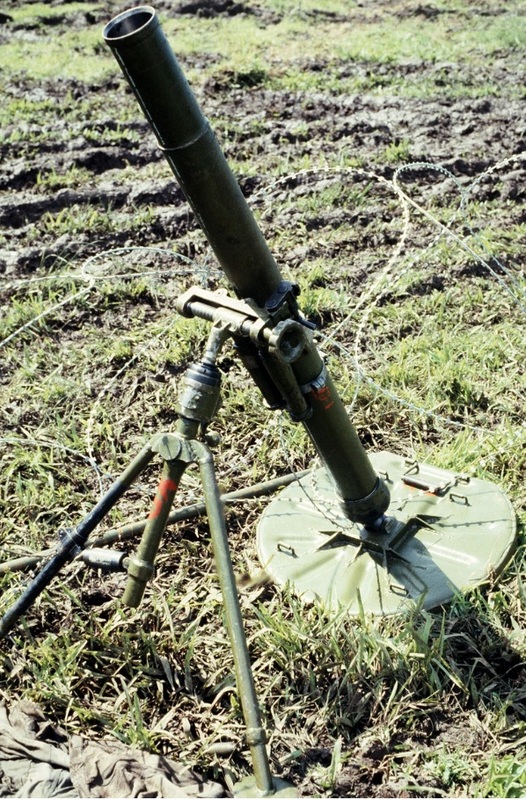 The 82-PM-41 was a muzzle-drop 82mm mortar of the Soviet army during WWII. During that war, it was issued at the battalion level. 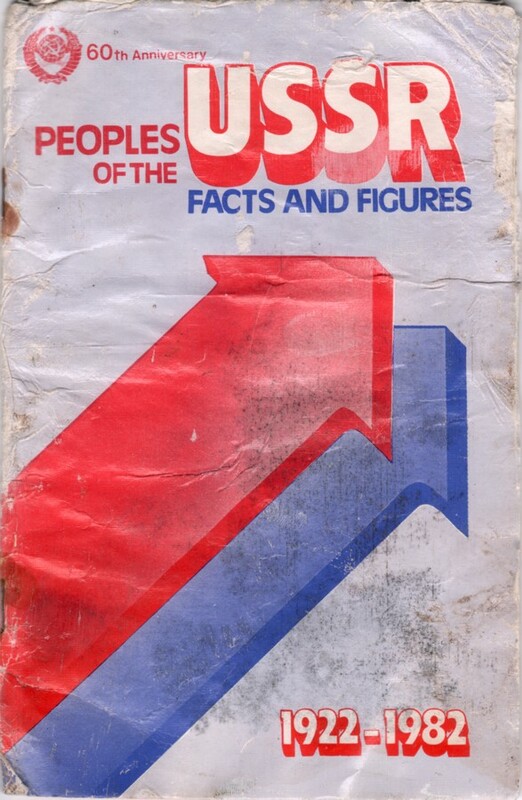 The Soviet army used it until the 1960s, then passing off much of it’s stockpile abroad, including Cuba. The Cubans and Grenadians probably had no set issuance doctrine. The 82-PM-41 weighed 126 lbs and had a range of about 3,000 yards. Cuba donated four WWII-veteran ZiS-3 towed anti-tank guns to the Grenadian army shortly before the American invasion. These four guns were, in fact, the only artillery pieces Grenada has ever used. The Soviet ZiS-3 was a 76mm gun that weighed 1 ¼ tons. It fired BR-350 (armor-piercing) or OF-350 (HE) 76.2x385mm(R) shells. In the direct-fire role, range against tanks was about 2 miles. In the indirect bombardment role, 12 miles was theoretically possible but 8 ¼ miles more realistic. These four old WWII guns had no impact on the fighting in 1983. The USA had complete air superiority, plus the benefit of offshore US Navy ships for gunfire support, and it was impossible for the Grenadians to reposition towed artillery. The AA weapons encountered were all Cold War-vintage, namely ZU-23-2 and ZPU-series towed guns. However there was one very interesting type captured by American troops, the Czechoslovak M-53. The M-53 is hard to classify as either a WWII or post-WWII weapon. They were designed and physically manufactured in Czechoslovakia at the start of the 1950s, but their actual firing components were the Soviet WWII-era Degtyarov DK drum-fed 12.7mm machine gun. 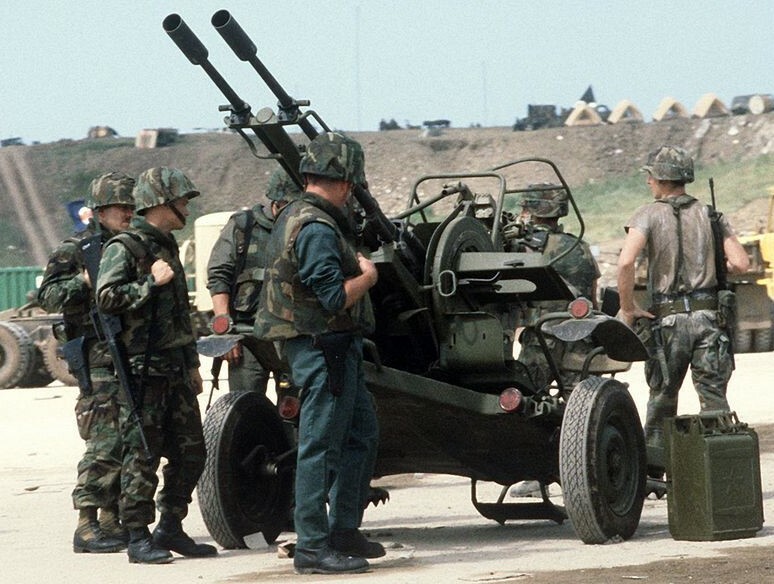 The M-53 was never really common during the Cold War, as it filled the same niche as the USSR’s ZPU-4 which dominated the export market in the communist world. The origin of the weapons in Grenada was no mystery. 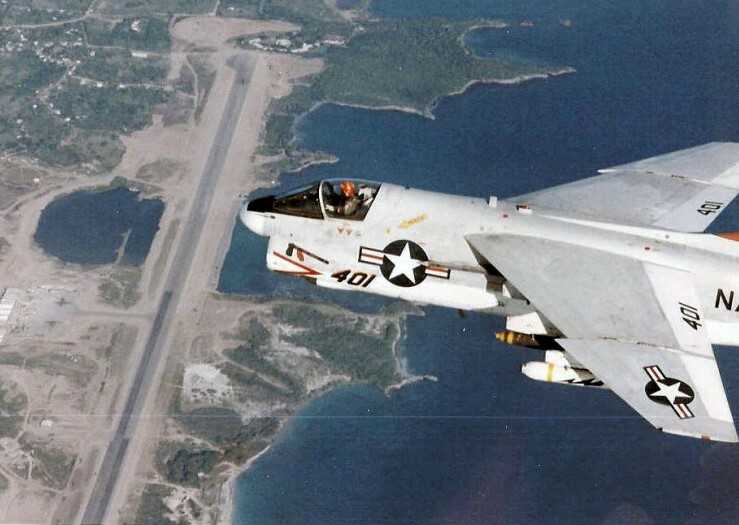 They had been provided to Cuba at the start of the 1960s, this is for certain as American reconnaissance planes during the 1962 Cuban Missile Crisis were engaged by M-53s over Cuba. 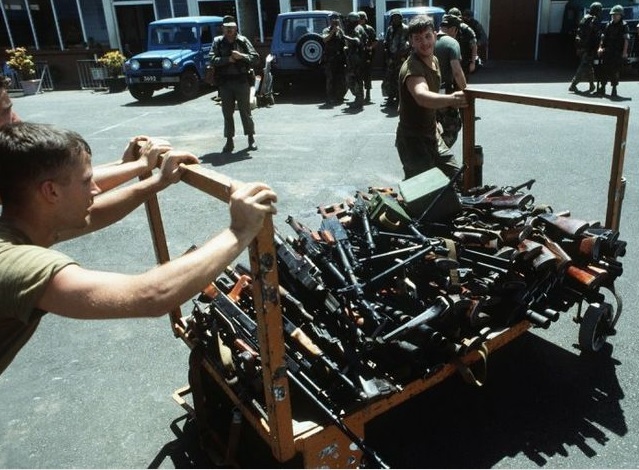 Apparently Castro had donated some of these old weapons to his Grenadian allies. It is thought (but not known for certain) that a M-53 was responsible or partially responsible for shooting down a UH-60 Black Hawk helicopter on 25 October 1983; the first UH-60 ever shot down in combat. None of the vehicles, aircraft, artillery, or warships used during Operation “Urgent Fury” were of WWII-vintage. On the other hand, the operation saw the combat debut of some new systems: the UH-60 Black Hawk helicopter, Spruance class destroyer, and Pegasus class hydrofoil (the first and last combat use of that type). 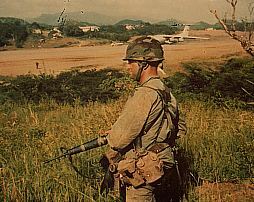 To American civilians, the most notable debut was the PASGT helmet. During the Gerald Ford administration, the US Army began studies on replacing the M1 steel pot helmet, a design which had been in constant service since WWII. The Army instructed would-be designers to make a new helmet with optimal performance characteristics, irrespective of it’s appearance. The winning design was nearly identical in shape to the WWII German M42 stahlhelm and the Army quietly requested some minor cosmetic changes, but the kevlar PASGT still shared a resemblance to the steel German helmet. 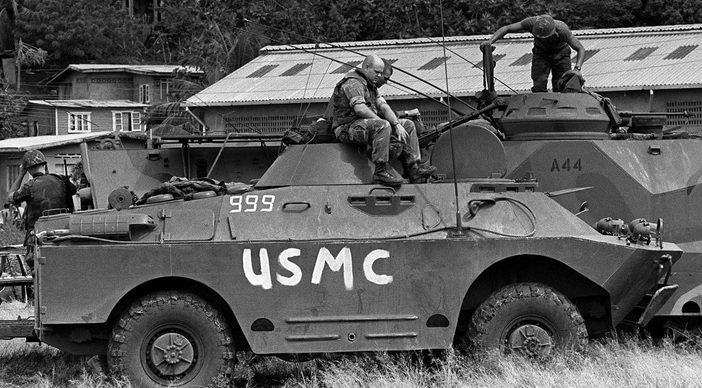 During the Grenada invasion, some – but not all – of the American troops had new PASGTs, and it was the first time many startled American civilians had ever seen American troops in anything but M1 pots. The PASGT was briefly nicknamed “the Fritz” before the similarity was forgotten and the nickname faded. To give at least a token nod to multilateral diplomacy, Reagan included very tiny contingents from other small Caribbean nations. Only 350 men strong, this force did not participate in the initial attack and with the possible exception of the Jamaican troops, American commanders considered them useless. Some of the Caribbean troops themselves had WWII equipment. 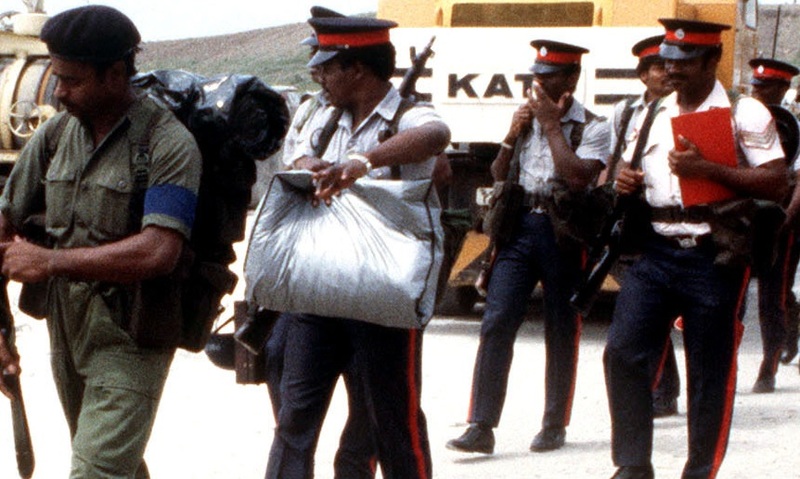 President Reagan was always adamant about gathering captured documents and Grenada was no exception. 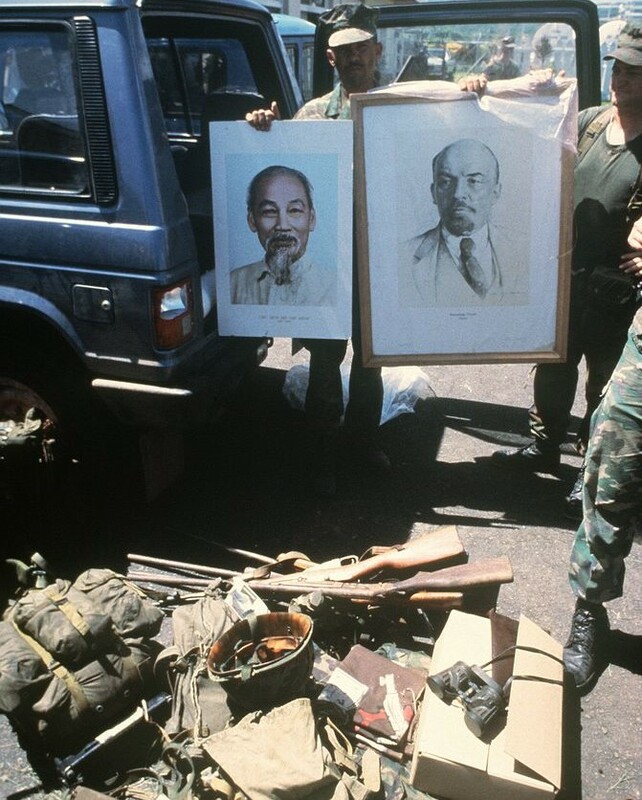 The original copy of the Soviet-Grenadian treaty, which outlined the first two tranches of military aid, was captured intact. 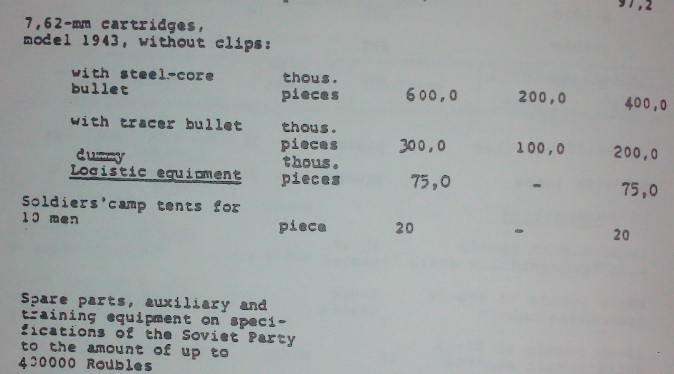 The quantities of weapons were in excess of the treaty, apparently showing that the USSR shipped more as a matter of logistical convenience, or, that there was an unwritten understanding that additional guns and ammunition would be provided. For certain, none of the WWII-vintage systems had any intelligence value by the 1980s and most of the postwar-design systems were also obsolete. 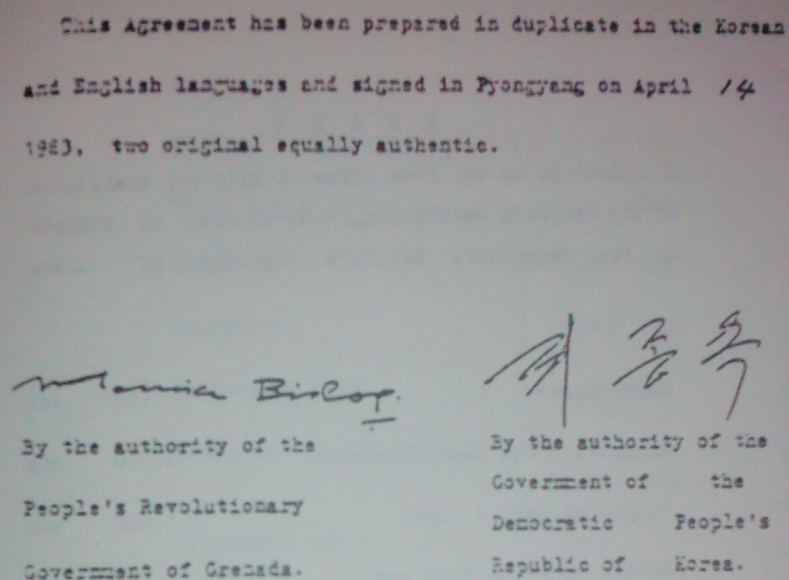 One of the more surprising finds was an arms agreement between Grenada and North Korea. North Korean involvement in the Caribbean had previously thought to have been minor. Twenty-four North Koreans were captured in Grenada, they claimed to be diplomatic advisers and Reagan released them to go home without further comment. The vast bulk of the small arms, and staggering quantities of ammunition found, came from Cuba. The Castro regime went to great lengths to hide it’s all-but-obvious involvement in Grenada. 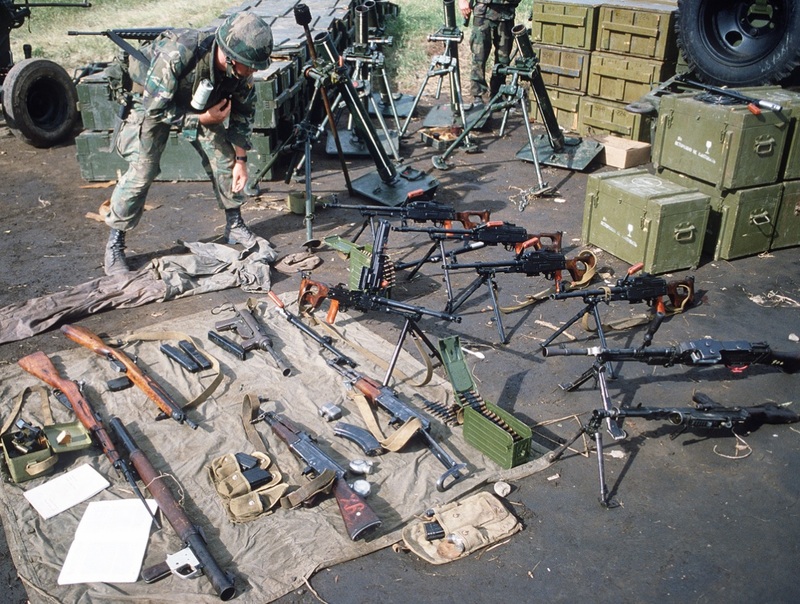 The US military divided captured items into two categories, “contemporary” and “legacy”, with 1973 being the cut-off with the exception of AK-variant rifles as it was too time-consuming to date them on the spot. For the legacy weapons, no differentiation was made between WWII and post-1945 weapons. Some effort was made to trace the arms. Some Mosin-Nagants had Hungarian proof stampings, but it’s not thought that Hungary directly supplied Grenada; rather that these guns had been shipped to Castro in Cuba decades earlier. The most astonishing find was the huge stockpile of ammunition – 5.5 million rounds of 7.62mm rifle ammunition, smaller quantities of British and Parabellum rounds, and 8,900 mortar and artillery rounds. A US Army officer estimated that the captured quantity would suffice an entire NATO division for a month of high-intensity combat, and could seemingly equip the little Grenadian army until the end of time. 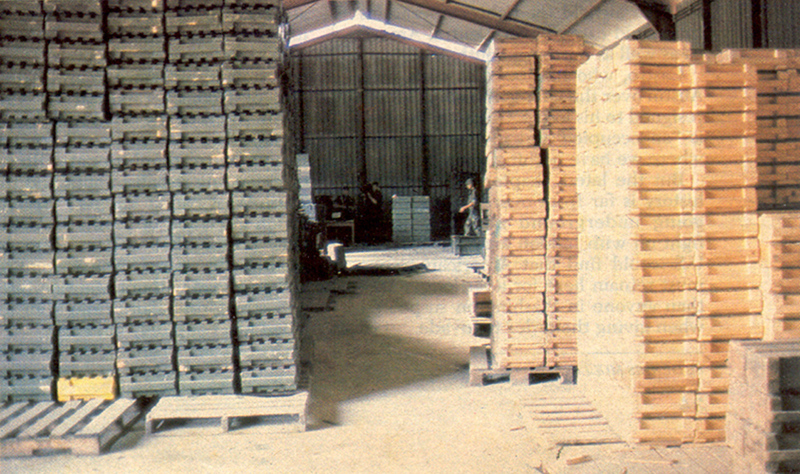 The vast stockpile of ammunition, crated for quick shipment, might lend credence to the theory that the USSR’s interest in the Point Salines airfield was not to benefit Grenada’s tourism industry. 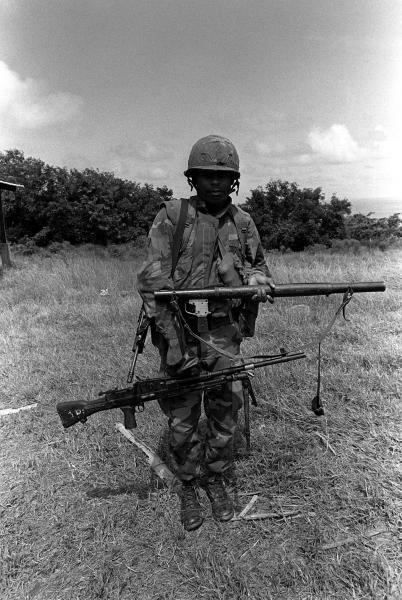 Grenada was the last time American servicemen were allowed to bring back battlefield capture weapons. 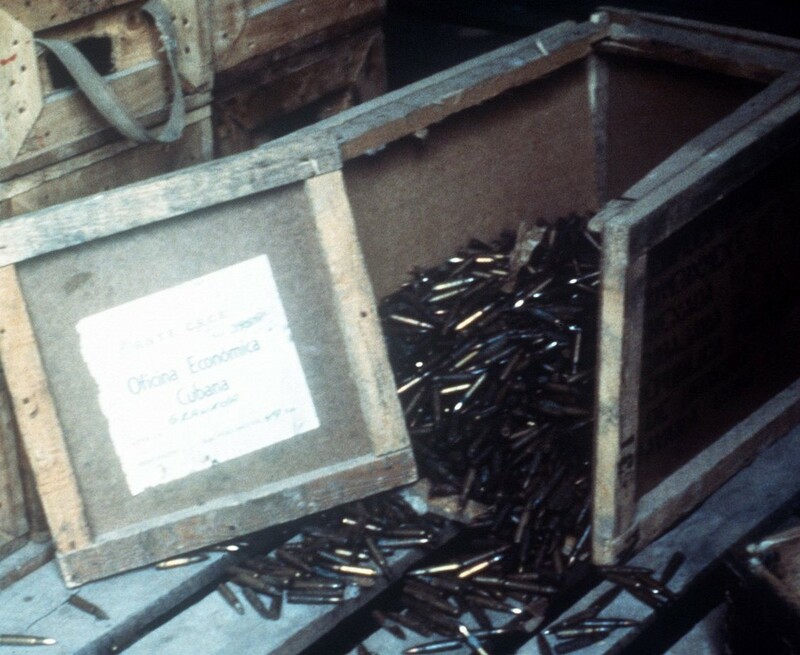 The US Marine Corps organized a lottery of suitable captured weapons. Excluded were grenades, rockets, machine guns, and full-auto firearms. The most prized Grenada trophy wasn’t any of the WWII weapons, but rather the Czechoslovak-made vz.52 rifles. Nobody thought that the Cold War would be over at the end of the decade, and these were viewed as an ultra-rare opportunity for an American to own a rifle from behind the Iron Curtain. Political pressure afterwards ended the military’s war trophy program, and Grenada was the end of an American military tradition that stretched back to George Washington’s army. Grenada returned to being a quiet and forgotten-about Caribbean island. The airstrip which served as the focal point of the invasion eventually opened for tourist flights. It remains a point of debate today, regarding it’s intentions in 1983. Operation “Urgent Fury” was massively popular with the American public, and enjoyed heavy congressional support from both Republicans and Democrats. Conversely it was almost universally condemned elsewhere, including American allies Great Britain and Canada (which had been helping build the airstrip). Obviously it was strongly condemned in the communist world. For the American military, the completely successful operation ended a bad streak which had started with the humiliating 1975 evacuation of the Saigon embassy, through the bungled Iran hostage rescue attempt, and the Beirut barracks bombing earlier in 1983. The biggest loser was Cuba. During the late 1970s and early 1980s, Castro had dispatched thousands of Cuban troops from Angola to Libya, and was trying to portray himself as a major player. The complete inability of the Cuban military to reinforce the Grenada garrison during the fighting exposed it as a house of cards built on Soviet funding and support. Amazingly, some WWII weapons are still in use in Grenada today in 2015. Some of the captured Enfields were released back to the country after it’s government was reformed following the invasion. 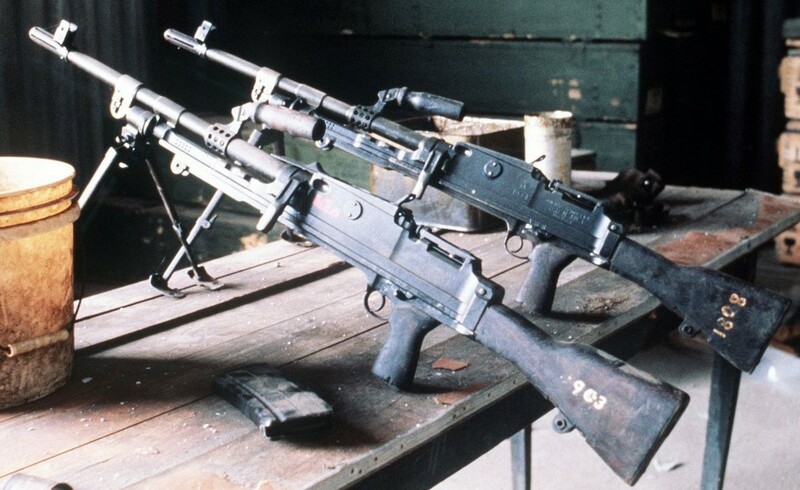 The Bren guns pictured are L4 Brens. They are Mk II Brens converted to 7.62 NATO by Britain. The flash hiders and spacing disk on the side of the magazine well give them away.The British Army used them until the late 1980’s. Also the magazine pictured with them is not the aggressively curved .303 variant. The pistol referred to as a P-38 is a P-08 Luger, manufactured by the Germans until 1942-3. Millions were manufactured and after WWII they were exported everywhere. Hi Tim yes you are correct. I fixed the typo on the Luger. The P-38 pictured in the article is a P-08 Luger. Hi Jim you are correct, I fixed the typo. The pistol listed as a P-38 is actually a P-08 Luger. Yes that is correct; I have foxed the typo and thank you for the catch! That’s a P08 Luger in the picture, not a P38. Hi Scott, you are correct and I have fixed the typo. The US Army Rangers stationed at Hunter Army Airfield, Savannah, GA brought back captured weapons and a lot of the captured ammo was sent to the Fort Stewart Ammo Storage Facility which is about 40 miles southeast of Savannah. From looking at it, I think it could be 7.62x45mm ammo for the vz. 52 rifles. Although it could also be 7.62×39 ammo for the AKs. The grenades were between 117mm and 125mm long with their fuses in place, so that means they were probably 80mm or so with the safety cap on them. The 7.62×39 round is 56mm long so that makes me think that is the most likely. The 7.65×45 round is 80mm long, so that would make it nearly as long as the grenades. Likewise, the 7.62x54r round is also long, 77.16mm, so that would pretty clearly mean those rounds can’t be 54r rounds. Plus, you cannot see the rim, which is rather distinctive on that round. Yes I do believe you might be correct. LOL wow I am always amazed at the knowledge out there; excellent catch!